The attacks on London carried out with strong bomber forces (21–22/1, 29–30/1, 3–4/2) were in all respects a surprise fro the RAF and the population. Reports of their effects from the Abwehr state that lasting damage was caused in the residential and business quarters in the heart of the city as well as in the dock area on the Thames Bend. Several hits on traffic junctions led to railway interruptions. A number of works (precision instruments and signals equipment) working for the Ministry of Aircraft Production are reported as being destroyed or damaged. Particularly to be noted is the reported destruction of an important factory for the production of airscrews situated on Croydon A/F [airfield]. The "Little Blitz" didn’t stop London’s criminals from going about their usual business. For example, the air raid of 21/22 February was followed by a smash and grab raid on a jeweller’s shop in Houndsditch next morning. For lots more about this less discussed aspect of the war, see An Underworld at War by Donald Thomas (John Murray, London, 2004) ISBN 0-7195-6340 2. Intercepted signals about the allocation of He 177s to I./KG 40 in late March 1944. The Kriegsmarine war diary for 19 March noted that: "131 of our bombers were despatched against Hull, or which 103 reached the target. 9 aircraft were lost". This was a highly optimistic assessment. The reference to an Me 410 of 1. (F)/121 was based on the claim by a prisoner from that Staffel that: "One man flew from our unit over Portsmouth on the 25th and took photographs." This statement turns out to have been incorrect, the photos having been obtained by a Bf 109 early that morning. This aircraft probably came from 4. (F)/123 which covered the central part of the English Channel. A more extensive account of the Bristol raid of 14–15 May 1944. Report on an intruder operation by II./KG 51 over Eastern England on the night of 11/12 May 1944. A page on first operations against the Anzio-Nettuno beach head. A report on a mining operation by KG 76 off Anzio on the night of 26/27 March 1944. Carsten Petersen says that the aircraft at centre right was photographed at Aalborg-West and belonged to KG 100. Jörn Junker concurs. 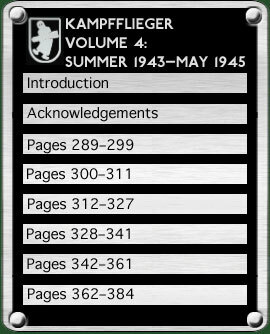 Almost 700 words of the manuscript were omitted from the book as published; they cover the period 24 February to 29 April 1944 in Italy and should have followed right after the order of battle table on this page. The aircraft in the photograph has the mountings for FuG 200 but the antennae themselves are not yet installed. Click on the link for the results of German pre-strike reconnaissance of Corsican airfields; on the next for Allied and German reports of the air raids on Corsican airfields; and on these to see how it affected the RAF's 251 Wing and 322 Wing. My thanks to Yves Marino for drawing my attention to an essay on author Joseph Heller's combat experiences with the 340th BG, which included the German attack on the Corsican airfields. The following day, Allied aircraft struck back at German bomber bases in Northern Italy, destroying (for example) six Ju 88s and a Savoia at Villaorba, while losing a P-38. On 15 May, LG 1 and KG 76 were ordered to take off at 22.00 hours. Flying via Ravenna, Rieti and Avezzano, they were to cross the front at midnight and attack three towns between Cassino and the coast. As far as possible, ground troops were to mark the front line by firing white Verey lights. The return flight would head over the sea, crossing the coast between Cape Linaro and Orbetelllo at 00.52 and returning to base just after 02.00 hrs. Seventeen aircraft of II./LG 1 flew the operation without loss. An attack in the same area was ordered for the following night but then cancelled. The raid took place instead on the 17th and a 5./KG 76 illuminator was brought down by AA fire. Perhaps it was the observer’s ‘complete lack of interest in his duties’ that gave his interrogators such a negative picture of what he bitterly called ‘KG Lustig’ (KG Happy). It is this observer’s words which make up the second quotation on the page. The caption to the profile is incorrect. In fact it depicts the aircraft whose photograph appears in Kampfflieger Volume 2, page 154. That photo also shows a unit emblem below the cockpit on the port side which is not visible in the profile.